Many people enjoy a glowing fire, but don’t have a fire-safe spot in their backyard to make one. Even if a yard is spacious enough to have a traditional bonfire, the hazards of exposed flames (or the remains of an old fire) are unappealing to most people. A fire pit may be an excellent alternative in this instance. Fire pits are usually free standing units with legs and bottoms. They are designed to contain the fire and radiate the heat in a 360 degree circle. The fire pit is the most recent addition to the outdoor fireplace family. With the average price starting around $120, they are a very affordable option. They can be fueled by wood, charcoal, propane, or natural gas. As with any fire, fire pits can be dangerous if precautions are not taken. Common sense should always be used and manufacturer’s guidelines should always be followed. 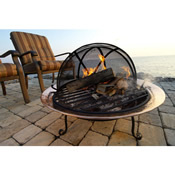 A popular outdoor wood burning fire pit is the Copper Basin Fire Pit. This wrought iron unit comes with a grate and is available in three different widths. Also offered is a hinged spark screen that will be well worth the additional cost. It will help keep those embers and ashes contained- keeping you safe and secure. Keep in mind that fire pits combine style and function. The almost endless designs and many optional accessories will help you enjoy your outdoor space for much longer than just the warm summer nights. Reclaim your time, and enjoy more of the day with an outdoor fire pit.